At Tri-City Lanes we have many different bowling leagues including traditional bowling leagues, different scoring methods like 9 Pin Tap (9 or more on your 1st Ball counts as a strike), different premiums (some leagues have cash prizes, some have bowling balls and other have fun prizes). You can even form your own bowling league. If you do not have a team we can place you with others looking to make a team, and in the type of league that best fits you. We have a league format that is just right for you! Millions of American bowl in leagues every week – are you ready to give league bowling a try? Call us at (864) 859-7103 or fill out the form on this page for more info. 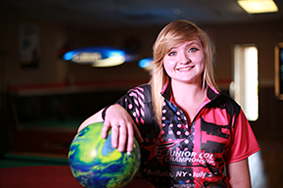 Whether you’re new to the sport or a seasoned bowler, Tri-City Lanes makes it easy to find the league to match your interests and skill level.